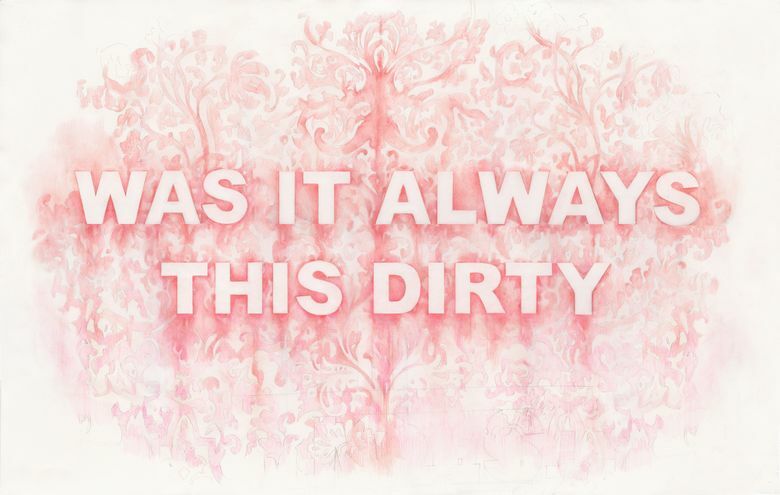 Edgy and contemporary, with a touch of Victorian Gothic, artist Amanda Manitach’s work taps into a vein of longing, a kind of hide-and-seek sensibility, nurtured by social media, where connection is sought through self-revelation, liking, lurking, and following. But everything is not fine. There is ghostly evidence of underwriting and whispers of deterioration. The patterns fade into the white of the paper, like evaporating smoke or the blurred edge of a photographic vignette. Color seeps from the letters, like rust stains accumulated over years. Although the phrases — conjured up and gathered by Manitach — and her painstaking mark-making seem profoundly personal, the art speaks to many. Recently, I attended the opening of Manitach’s exhibition at Winston Wächter Fine Arts with my college-age daughter and her friend, where we talked with a variety of people. Over and over, people nodded and laughed in recognition of the sentiments expressed, as if the confessions of love and angst were their own. Edgy and contemporary, with a touch of Victorian Gothic, Manitach’s work taps into a vein of longing, a kind of hide-and-seek sensibility, nurtured by social media, where connection is sought through self-revelation, liking, lurking, and following. It’s no wonder the Seattle-based artist has enjoyed a lot of success lately. Between the current show at Winston Wächter, prepping work for December’s Pulse Miami Beach Contemporary Art Fair, and her role as Visual Arts Editor for City Arts Magazine, Manitach has been busy. This obsessive, meditative devotion is embedded in her drawings, which create a visceral tension between the sharply delineated texts and their transitory backgrounds. We are lured into contemplation of emotion and physicality. The phrases emerge as if out of someone’s breath on a bathroom mirror or a horrific apparition on the wall. The backgrounds, in fact, are inspired by 19th century wallpaper and suggest femininity, intimacy, and the passage of time. The works are larger than you might expect. Typically three-and-a-half feet tall or wide, they can get even bigger than that, enveloping your field of vision. Drawing closer, the artist’s repeated gestures are clearly evident, even more so in this latest body of work. There are thousands of pencil marks in each drawing, some of them visible, some of them smudged away. They accumulate and disappear, constructing an awareness of time, both the time that Manitach spent creating the work and a play between past and present. Manitach’s physical process is almost palpable in these recent works, with occasional bursts of a single, aggressive line or more orderly groupings of pencil passages. This latest series is titled “Dirty,” a reference to the graphite that smears onto her hands and arms, and, perhaps, to feelings of degradation and the messiness of love and life. But, in the end, these are not despairing works. They are infused with graceful beauty, lush tones, and clever, incisive turns of phrase. They are beguiling and brash and they are speaking directly to you.